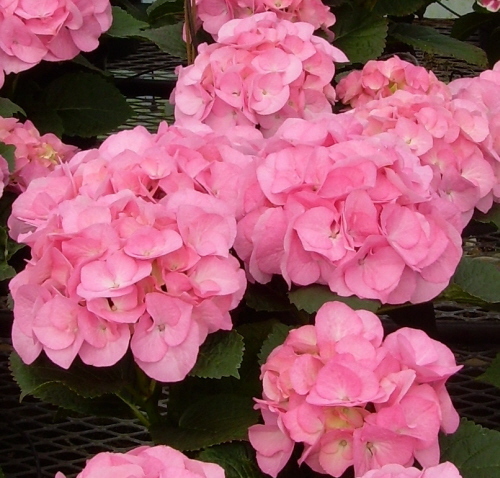 Dahlstrom & Watt Bulb Farms offerings from Hydrangea Breeders Association (HBA) material. 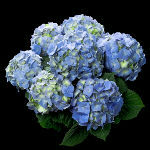 We are pleased to announce that we are able to now offer you this selection of HBA Hydrangea varieties. We have conducted our own trials of these varieties and are offering the following varieties from your use. Quantities are still in the trail phase and orders can be filled upon request. This information is also available in pdf format. A printer friendly format. Just click the icon below to print or save the file for your own use. We see it as a very good introductory guide to these new varieties. White Spirit: strong white semi lace cap. 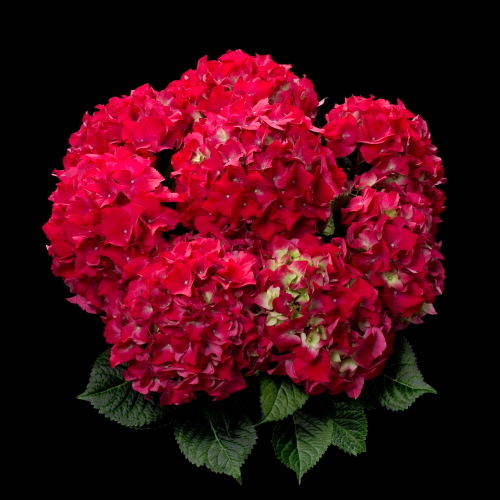 To the untrained eye this plant can be mistaken for a full headed (mophead) hydrangea. 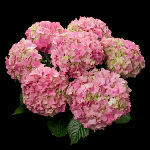 Large grower good for standard and larger sized pots. Forcing is approx 80 days relative to others. Very suitable standard U.S. size plant. First White: White mophead. Medium to strong growth and stem. Forces slightly faster then some at about 75 days. Very clear high quality white head. Very suitable standard U.S. size plant. Pink Beauty: Pink mophead. Light pink color. 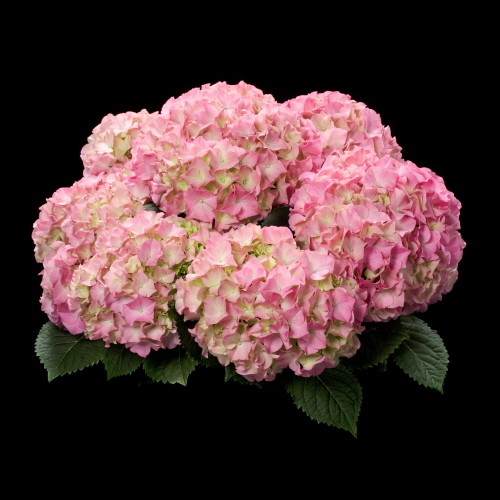 Different color then many pink hydrangeas on the market in the U.S. today. Very strong stem and firm grower. forcing time is about 75 days. 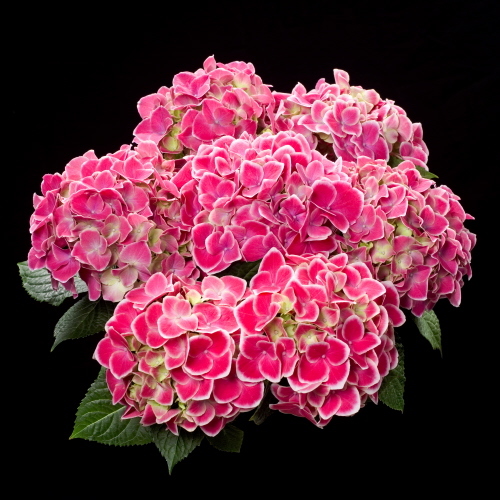 One of the best pink colors and overall plants from this HBA selection. Very suitable standard U.S. size plant. Red Beauty: Red mophead. Very good red color. Better red color then any other traditional red variety offered. Medium to strong grower. Forcing time is about 80 days. A little smaller then the pink beauty but overall acceptable considering the intense red color. Very suitable standard U.S. size plant. Bela: Blue mophead. Very good blue color. 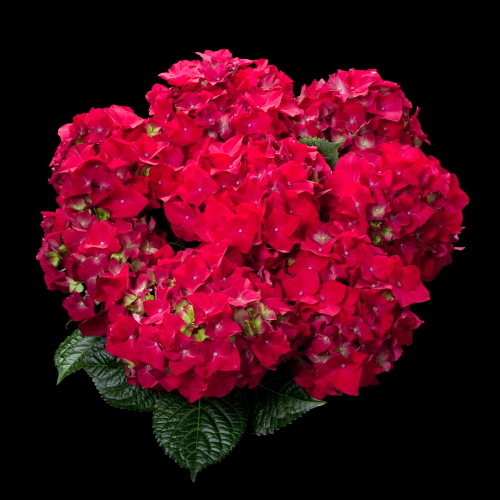 Very strong grower with sturdy stems. Forcing time is about 80 days. One of the tallest HBA selections. 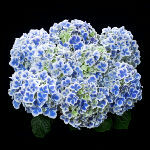 This plant looks to be derived from Blaumeise in as much as the foliage and flower color are similar. Recommend a trial of this variety. Very suitable standard U.S. size plant. Early Blue: Blue mophead. Very good blue color. Strong stem with compact growth. Forcing time is about 75 days. 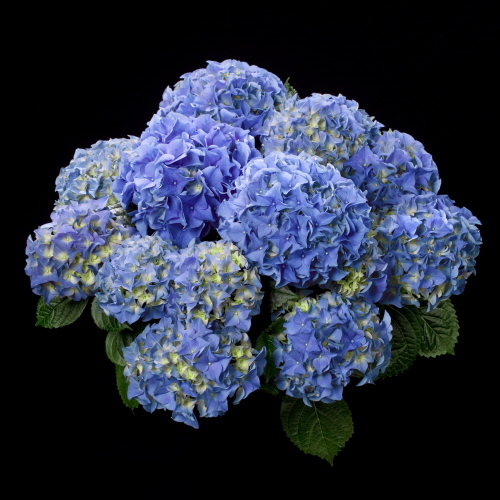 This is the shortest blue variety offered in the HBA selection. 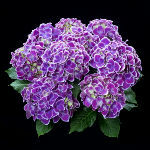 This variety has promise being sold as a 6" or 1 gallon size finished hydrangea. The plant is a smaller "European" sized grower. Stephanie: Pink mophead. Nice medium pink color. 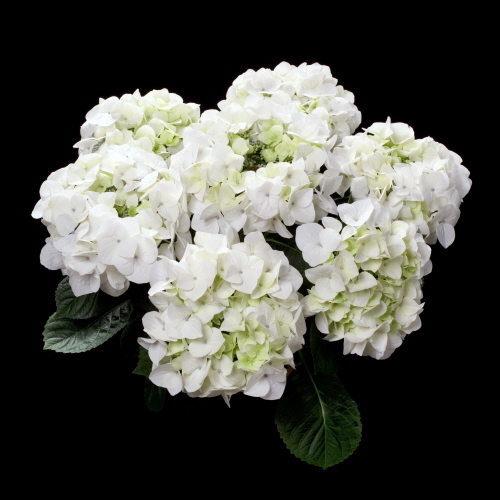 Medium to strong stem with compact growth. Forcing time is about 75 days. Not as even as some of the varieties with respect to flower timing but has tremendous multi branching habit. Produces lush full plants. This is one of the shorter pink selections in the HBA lineup. The plant is a smaller "European" sized grower. Pink Delight: Pink mophead. Nice medium pink color. 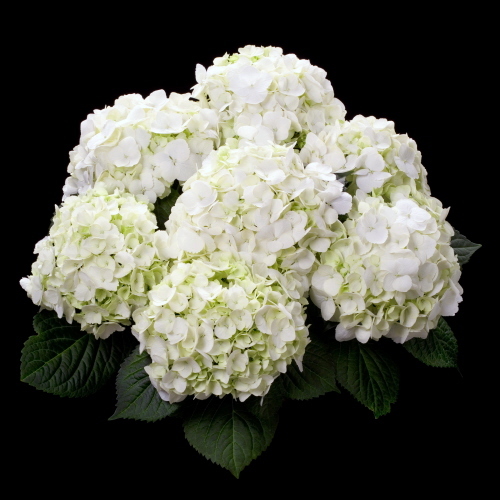 Medium to strong stem with compact growth. Forcing time is about 75 days. Even Flowering with a somewhat flat flower head. This variety is a little shorter then pink beauty. The plant is a medium sized grower. Bavaria: Blue and white bicolor mophead. When done correctly this variety can be quite blue. Weak stem requires staking. Forcing time is about 75 days. Does not have the best growth characteristics but the end color can often make up for it. The plant it a smaller "European" sized grower. Hot Red: Red mophead. Very intense red color. The reddest offering from HBA. Strong multi branching nature. Plant is a miniature grower. Suitable for only the smallest 6 inch finished offerings or lesser sizes. Forcing time is about 80 days. The plant is a smaller "European" sized mini grower. Tivoli: Pink and white or purple and white bicolor mophead. Tends to have more color (pink or purple) then white in the flower. Can be forced as a purple. Strongest branching habit of the bicolor varieties to date. Plant is a small to medium grower. suitable for 6 inch finishing and possibly 8 inch. Forcing time is about 85 days. The plant is a smaller "European" sized grower. *These are only general recommendations. Cultural and environmental conditions will influence growth.